The Damascus steel used in the Case Whittler comes from the Devin Thomas Damascus steel foundry and is one of 15 patterns currently produced there. Devin Thomas spent years learning the forging of Damascus steel and created distinctive Damascus patterns with hammer marks applied during the forging process. Ground and polished into the final shape of the knife blade, the steel layers reveal geometric designs like the concentric circles of the raindrop steel. 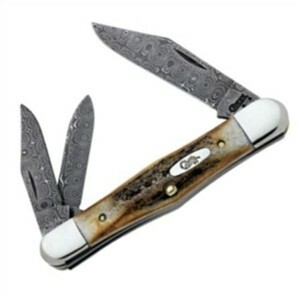 The Case 6092 Whittler uses this raindrop Damascus steel in all three of the knife's blades. The knife offers clip point blades in large and small sizes and a penknife blade. Damascus steel gives the blades extra strength as well as unusual beauty, and the high carbon steel alloy provides the long-lasting edge a whittler prefers. A drop of oil rubbed across the blades occasionally prevents corrosion. When folded, the 2.1-ounce Whittler measures only 3-1/2 inches, a perfect size for the average pocket and still big enough to offer a secure grip. Natural India stag handle slabs add non-slip texture. If you're interested in going beyond simple whittling but still prefer a pocket tool set, consider the Flexcut Carving Multitool.